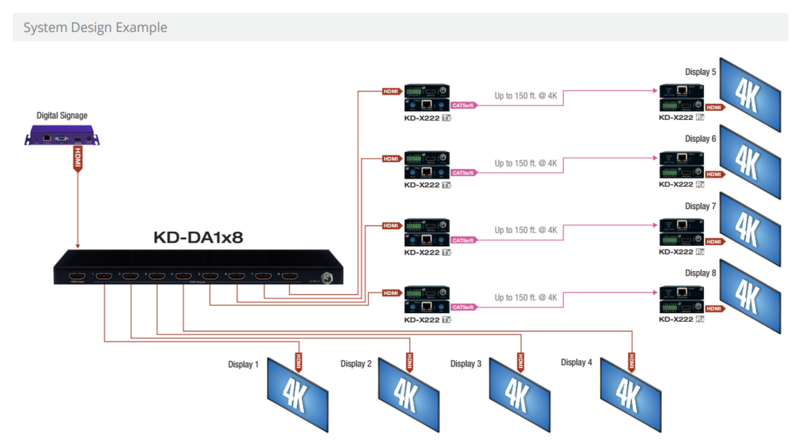 Key Digital's KD-DA1x8 is an extremely high-performance 1x8 HDMI Distribution Amplifier that offers resolution support up to UHD 4K60 4:4:4. 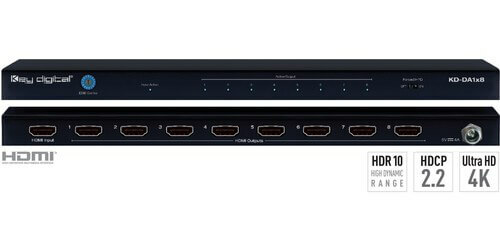 This device was designed to offer the best in quality, performance, and reliability, while providing a cost-effective HDMI distribution solution for smaller scale projects. 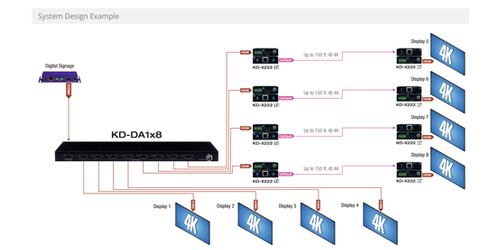 The KD-DA1x8 provides one HDMI input to 8 HDMI outputs for a supreme distribution system without signal degradation. These distribution amplifiers will support all SD, HD, VESA, and Ultra HD/4K video standards including UHD/4K, 1080p/60, 1920x1200, 3D and support of HDCP 2.2 and HDR, with Deep Color Support up to UHD/4K 30Hz 4:4:4/12 bits or 60Hz 4:4:4/8 bit. With EDID Control there is a built-in internal library with 15 EDID handshakes in addition to native EDID data of output/display. Futhermore the Full Buffer System manages TMDS re-clocking / signal re-generation, HDCP source & display authentication, Hot Plug Management and EDID Control handshake. Supported lossless compressed digital audio formats include Dolby TrueHD, Dolby Digital Plus, DTS-HD Master Audio and Dolby Atmos. The Key Digital KD-DA1x8 is a perfect choice when you want to have an easy set up distributing your HDMI UHD content, and with a 3 year warranty, you have the ultimate peace of mind knowing your purchase will be guaranteed for many years to come.